Back to School – Jr Dragsters!!! 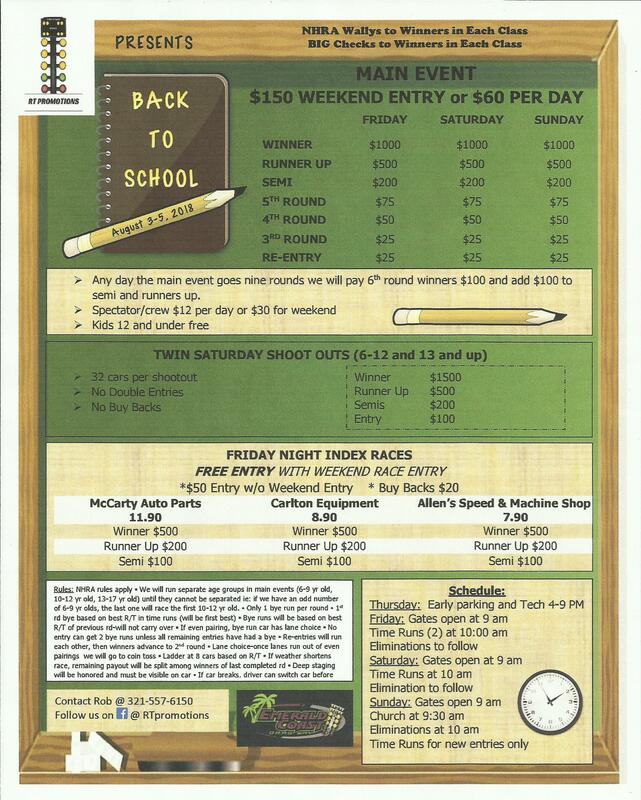 The Jr Dragster weekend we’ve been waiting for is quickly upon us, RT Productions presents “Back to School”, a weekend packed full of Jr Dragster racing August 3-5! Main events Friday/Saturday/Sunday in addition to Friday night index races and two shootouts on Saturday. We’ve got NHRA Wally’s and big checks to hand out to winners as well as loads of $$$ to be won. Spectator & crew entry fee is $12/day or $30/weekend, competitors and all kids 12 & under don’t pay to get thru the gate as always at ECD. Thursday Test & Tune – Gates and tech inspection open at 4pm, track hot at 6pm, track secure at 10pm. $12 at the gate, $10 gets you down the track, open to everyone not just Jr’s. Early arrivals for parking and Jr’s racing with us, your Thursday entry thru the gate is covered by your weekend pass and racers tech cards. Friday & Saturday Race Days – Gates open 9am, (2) time runs starting at 10AM, eliminations to follow. Sunday Race Day – Gates open 9am, church at 930am, Sunday time runs for new entries only, eliminations to follow. Contact RT Productions at 321-557-6150 or the track at 850-603-3991 / ryan@raceecd.com for more details!